A very nice and sunny apartment with one bedroom with balcony located at the back of an elegant building , which ensures peace and quiet. 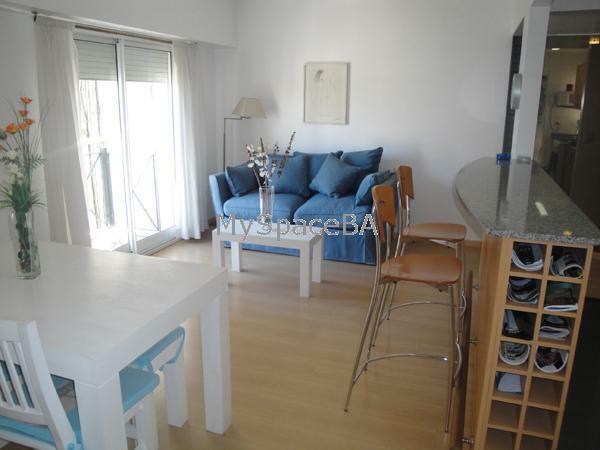 It is very bright and sunny and located in the heart of Recoleta . It is only 2 minutes from the church of Pilar and the best restaurants, cafes, and bars of Recoleta. The living room has a sofa bed, table and chairs. The kitchen is fully equipped and open plan to the living room divided by a breakfast bar. The bedroom has a double bed and air conditioning hot / cold . The bathroom is complete with bath tub and shower. Balcony to the back of the building . Bright and quiet with an excelent view . Wooden floors , two aircons hot / cold , cable TV , Internet High Speed . Landline telephone . Iron . Hairdryer . Safe Box . A very modern kitchen with microwave , fridge , freezer , coffee maker , toaster and a gas oven . It has all kitchen utensils and towels and bedding are suplied. Excellent building . Doorman 24hs . Two elevators. City centre, bus stop, church, university, college, gym, pubs, restaurants, pub, nightlife area, exclusive shopping area, shopping mall, park, square, cinema, museum, art gallery, cultural centre, concert hall, historical place, market, convention centre, laundry, parking space and bike path.